The patented Vapor phase Corrosion Inhibiting technology revolutionizes the way metal is protected in an enclosed package. VpCI-146 protects both ferrous and non-ferrous metals. 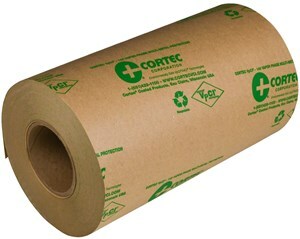 Made from the highest quality neutral natural kraft paper without the use of chlorine or other chemical bleaching. Extremely easy to use, you simply wrap your products to be protected and fold the edges together. Use adhesive tape as needed to hold paper folds in place.The VpCI coating on the paper vaporizes, reaching all metal surfaces to provide complete corrosion protection. The unique inhibiting action of Cortec VpCI forms a very thin and very effective layer that does not alter the appearance of products or require removal before further finishing or use. Parts protected with VpCI-146 can be painted, welded and soldered. The protective layer does not influence physical properties of most sensitive electrical components, including conductivity and resistance. Fully recyclable and repulpable. VpCI-146 is environmentally safe, non-toxic, biodegradable and doesn't contain any nitrites, phosphates, or silicates. 35 lb. paper.